Let’s start this year’s holiday gift guide for a person who I hope is on your list – the teacher! I volunteer every week in P’Diddy’s class and I see first hand how much patience, time and dedication goes into teaching. Managing 20 kids on a daily basis is not easy! Show them love through out the year, especially at the holidays. This year you won’t ponder what to buy because Teacher Peach makes it easy with some great teacher gift products! A holiday list of their most popular gifts! Once Upon a Box for SCHOOL teacher gift box is brimming with colorful items for teachers and their students including: 25 birthday postcards, 30 stickers, 25 mini-posters, a set of sticky notes, a “Teachers Only” Sharpie®, a stapler, and treats just for the teacher including a colorful Quartz wristwatch, a stay-cold sandwich container, and more. Once Upon a Box for HOME is designed just for teachers to encourage these hard-working professionals to relax, rejuvenate, and refuel—after school. From soft, fuzzy socks, a scented candle, and a beautiful bracelet, to a snuggly infinity scarf, teacher’s coloring book with colored pencils and sharpener, and more, this teacher gift box is sure to inspire even the most focused teacher to unwind! Modern 5-piece Teacher Desk Set thoughtful gift includes five essential desk accessories, available in eye-catching jewel tones or primary colors. Labeled with can’t-miss print-rich wording, these accessories are sure to become favorites for all of your favorite teachers. Sets include pencil and pen cup, stapler, tissue box, tape dispenser, and supplies holder. Creatives adore this set, too, and it’s even available in a decorative peach basket for presentation (saving even more time!). Jumbo Teacher Tote is spacious, durable, and very popular with teachers, the message on the “I Teach.” Jumbo Tote makes it the perfect teacher gift. Offering a simple and powerful expression that acknowledges ALL that teachers do, this tote bag reflects an incredible display of well-earned teacher pride—and has room for plenty of gear. Sweep Sips Insulated Stainless Steel Bottles make swell teacher gifts with their clever “DRINK it all in” or “I THIRST for knowledge” sayings. Insulation keeps cold beverages chilled for up to 16 hours and hot beverages hot for up to eight hours. Positive messages for students, too. Vivid color choices mean options for every teacher on your list. A Note From The Teacher! is an incredible monthly subscription box. 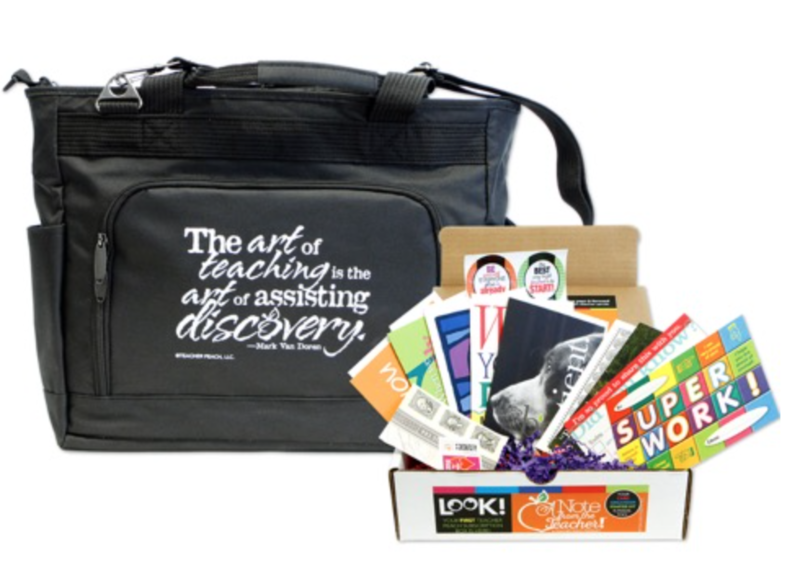 A sensational class teacher gift that keeps on giving all year long, PTO reps can choose from monthly, 3-month, 6-month, or 12-month gift options. Each month’s box includes 4 greeting cards with envelopes, 4 unique glossy envelope seals, 4 colorful postcards, 3 Forever stamps, 1 custom Teacher stamp, 1 Bonus seasonal greeting card and envelope, an extra envelope, tip-filled AnecNOTES™—and a FREE Card Organizer Starter Kit with the first purchase. The first box even comes with a thank you note so teachers can easily acknowledge the gift—in noteworthy style, of course! Teacher Ornaments that truly acknowledge what teachers do make the perfect add-on class gift topper as well as a meaningful individual family gift sure to be cherished for years to come. Ornaments come in three holiday colors and pearl finish with three different colorful messages, so stock up on these stocking stuffers and make it easy to cover all of the teachers on your list. Denim Inspiration Gift Tote’s on-target message captures the impact teachers make: Teach and change the world one student at a time. This bag is great for all seasons, too. Plus the Luxury Teacher Gift Quote Tote will have your favorite teacher stylin’! High quality tote filled with pockets will have plenty of storage to cart all their necessities back and forth from home to school. My fav part! Give a Gift That Gives Back! 10% of all product profits from holiday sales will go into the non-profit Teacher Peach Seeds, in which Teacher Peach will fund teacher “seed money” grants and Teacher Peach products for projects that GROW student confidence. What are you eyeing for your favorite teacher gift? I partnered with Teacher Peach for this sponsored post. All opinions are my own. This giveaway will end on November 16, 2016 at midnight MST. Winners will be drawn via rafflecopter. Once a winner is drawn I will contact them and they will have 48 hours to reply before I draw a new winner. Giveaway is open to anyone in US and you must be 18 years of age or older. Giveaway not affiliated with Facebook & I release them of liability. Winner will be posted in the rafflecopter widget. I love that this company gives back! I would like to get them the Teachers Rock the World Stainless Steel Water Bottle -- this would be a terrific gift. Some sweet stickers. I remember when I was a little kid in K I sooooo loved if I could earn a neat sticker. I still have my spelling book with heart and shamrock stickers. I would give my grandson's teacher the I Am a Teacher Ceramic Coffee Mug. So cute! Normally I do a gift basket and fill it with stuff I know the teacher can use themselves. I also buy supplies and whatnot throughout the year to help because I know they spend alot of their own money. I love the I Teach. Jumbo Tote! What great items! I like all their gifts with quotes and inspirational sayings, especially the tote bag. Wow! What an awesome gift idea! My daughter is a teacher. I like buying her things for her classroom that she needs. What an awesome gift. I know some deserving teachers! I like the Spring into Summer kit! I am a teacher and I love the Cool Teacher Pocket Folders! I have the utmost respect for teachers! I have a Son in kindergarten and could not be more grateful for teachers all around the world! I love the subscription box! The gift that keeps on giving! I love this idea. I usually give gift cards. Teacher Peach does have some great gifts. I would get any school supplies for the classroom I could. This is her first year and she could use all the help she could. I would choose their The Real Teachers Pet™ Dog Hoodie (Assorted Colors)! I like the Because It's All About the Kids™ Insulated Cooler Tote. I like the Black It Bag Set. We usually give out homemade goodies! We have a tradition of making giant gingerbread cookies for the teachers. They look forward to it every year. I think gift cards make great gifts for teachers. I would love to give the Teachers Rock the World Stainless Steel Water Bottle as a teacher's gift! We've done chocolate in the past, but I can't stop looking at that 'The Real Teacher's Pet' hoodie from Teacher Peach. I have no idea what I am getting yet. Last year I just did a gift card. I like the really cool family tools for back to school kit. No idea yet, but thanks for the link, i liked couple things ! Teacher peach does have many great ideas for gifts. I like the teacher peach gift box for home. Thanks for recommending this site!! It will come in very handy when buying teacher gifts! We always give gift baskets for the teachers. i usually do gift cards. this year i will probably bake something with the kids and include a hand made card from the kids. After speaking to several of my teacher friends, gift cards are always welcome. I would love to get my daughter's teacher the ceramic dog bowl and 6 ft leash as a gift this year. They have so many cool gifts. I love that website. I'm thinking about getting her some coffee. I struggle finding good teacher gifts so I love this. One of my best friends is a teacher and I know how much they do for our kids. I love that there is a site dedicated to helping people like me show appreciation for our teachers. This is a very cool product line! Poor teachers don't get nearly enough credit for what they do. I'm still perplexed as to what to give my girl's teachers. I like the Words to Grow By Deluxe Canvas Tote Bag with Rolled Handles. We don't have any great ideas, maybe a gift card!? Nice giveaway! I would love to give one of these boxes to my son's teacher. Love all of the wonderful ideas my favorite is Words to Grow By Deluxe Canvas Tote Bag with Rolled Handles and candles too. Thanks for the wonderful chance :) very generous. Good luck all. We always usually get a cute mug and then we make up little jars of coco and cookie mixes. My daughter's teacher this year loves animal crackers so we are going to be purchasing her an assortment so she can keep them in her classroom! I usually buy a little plate of cookies or candy at Wal-Mart. This is much better. We alays make the kids teachers something usually an ornament, picture frame, of coffee mug. I have two nieces who are teachers. Unfortunately they don't get gifts which are practical. I would gift certificates! Who couldn't use those?? My grandson has the best teacher ever this year and he is doing so well because of her. I think we are getting her a gift basket with some pampering stuff in it, bath salts, bubble bath, lotion that kind of stuff or we will get her a gift certificate. My son & daughter's teachers love candles, gift cards and my homemade chocolate chip cookies & fudge!